Filter by Standard Steam Gift Special Ed. 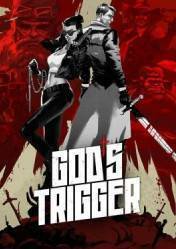 Attention: This version of Gods Trigger is for PC and in digital version in key format, cd key or Steam Gift. The digital versions of the PC games are in the form of a key or cd key, which must be entered into a Steam account to proceed with the download of the game. Some shops may have the "Steam Gift" label which means that an activation link will be sent instead of a cd key. Gods Trigger is an action game with an occipital point of view in which an Angel and a Demon unite in order to stop the apocalypse, a titanic task as we will have to face the legions of angels and demons ready to fulfill the prophecy. To deal with all the number of enemies we will have in front of us, we will have a lot of weapons, special skills and melee options in a spectacle of blood and explosions. We'll be able to perform authentic bloodbaths along the way. Each character brings their own unique powers. And along with an enormous amount of weapons and special customisable skills, we'll have the means to annihilate all enemies that stand in our way. There are no comments yet about Gods Trigger. You can be the first one!